I had to screenshot this while listening to NPR online recently. 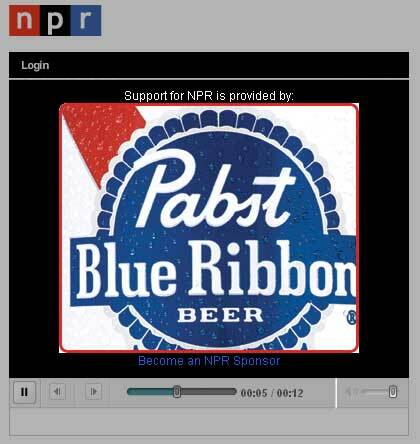 What beer would you more commonly associate with NPR? Wine? Stickie, what say you? Pabst is suported by Whole Foods Market… they had a lovely display on the Fourth of July Weekend. Maybe beers, like people, are able to change and grow out their mullets. NPR= white zinfandel I imagine it as a party where people stand around talking about the five seconds of a clip they remember hearing on the way home from work while listening to boring elevator music that is “trendy in New York” while talking up the virtues of a wine that shouldn’t exist except at your grandmother’s house in a box. Pass the PBR and pull up a lawn chair! Employee owned, environmentally concerned, raising funds for local charities with public film festivals and bicycle operated carnivals —> New Belgium Brewing should be the official beer company of NPR.